A valuable lesson you learn as a kid is how to tie your shoelaces. Whether you use the bunny ears method or the loop de loop method tying shoes is something most of us do every day. 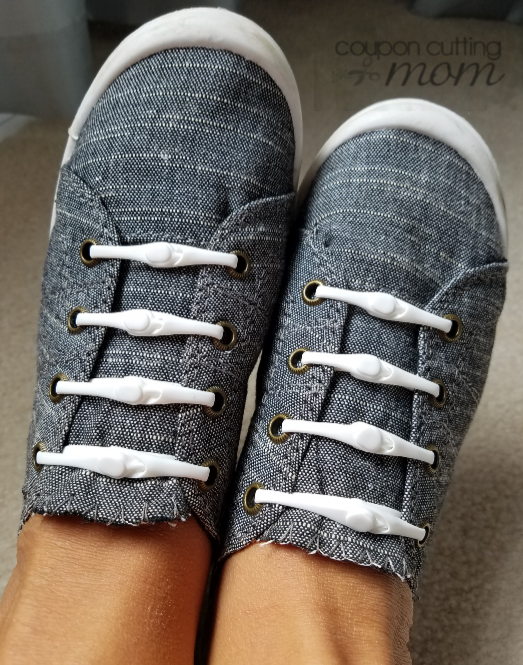 On mornings when the kids are trying to rush out the door to school or you are running late for work wouldn’t it be great to be able to rapidly slip into your shoes and not have to tie the laces? Shoelaces have evolved! Introducing HICKIES – No Tie Shoe Lacesfollow! These adjustable elastic straps put an end to tripping over dirty untied laces and turn your favorite pair of shoes into slip on and off shoes. No more loose ends and no more wasting precious seconds trying to re-tie your shoes in the middle of running a race. Now no one in the family will ever tie their shoes again thanks to HICKIES! These no tie shoe lacesfollow are easy to install and are entirely customizable making every tie pair of shoes a slip-on pair with a perfect fit every time! Eash HICKIES strap connects to a single pair of eyelets so you can create an adaptive fit with different tension levels throughout your shoes. Just feed the strap through one eyelet into the other eyelet and then “lock” the strap in the center to connect. There are severeal other ways to lace up these flexible straps too which allow you to get a looser or tighter fit depending on your shoe type and need. There is no right or wrong way to use these straps. They can be criss-crossed in a variety of ways to accommodate everything from narrow to wider feet. Check out these how to videosfollow to find the perfect lacing system for your needs. HICKIES No Tie Shoe Laces offer both adult and kids sizes both in a variety of colors. Each pack of HICKIES includes 14 straps. These straps are made from a durable thermoplastic elastomer which allows the straps to contract and expand independently to adjust to your every move. I love that the HICKIES Lacing Systemfollow fits with almost every shoe out there, as long as they have eyelets. Sneakers, boots, work shoes, dress shoes all look fantastic with these no tie laces! Kids love how they can use a color combination of these straps to add more glam and color to their sneakers! Say goodbye to tying bows forever when you use HICKIES. They are perfect for traveling, running, training, walking the dog, and really, just about anything. Get your HICKIES herefollow.